Antioch resident Mina Guevara has grown up around cars all her life. 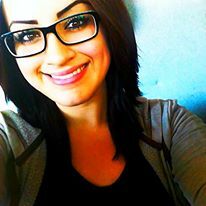 Her father, George, owns a car dealership and smog station in Antioch. On October 3, 2013, at age 16, just 10 days before she turned 17, she became the youngest Automotive Service Excellence (ASE) Certified Smog Test and Repair Technician in America. Mina’s been working as a service writer since her dad’s shop, VIP Smog opened in 2011. The shop is located at the corner of West 10th Street and Auto Center Drive in Antioch. She also passed her state test of the Bureau of Automotive Repair’s STAR Program, which allows her to provide vehicle smog inspections. Mina is a hard worker. She amazingly graduated from high school a year early, at age 16, by doing 100 hours of home work each week, even while working over 60 hours per week at VIP Smog. “I was ready to start work and pursue my goals and interests,” Mina said as for the reason for getting done so quickly. She’s now also working at the new family business, Little Mexico Restaurant, that just opened on W. 10th Street next door to the smog station, as part of her pursuits into the restaurant business. Mina recently applied to Le Cordon Bleu Culinary Institute in San Francisco. Her desire is to open a steak house, some day. But, for now you can get your car smogged by the youngest technician in America while you enjoy some of her authentic Mexican food. A question has been asked about citizen’s viewpoint on ½ % sales tax increase in Antioch, it did not mention that it would last for 7 years. Before I reply to the question, I believe that my observations are necessary to clarify my opposition to Measure “C”. It will be a single item on the Ballot on November 5th. I forecast a small voter turn-out which, unfortunately, will not fully represent citizen opinion on this major issue. I make this plea: Please, please vote. We need a high count. That is very important. It sends a message to our politicians’ to consider before they attempt to raise more Taxes in Antioch. The Mayor has told me that he believes a large majority of Antioch support Measure “C”. If the count is something like 2000 YES and 1985 NO is that a real majority? My desire is to give the reader background information (as a pseudo reporter) especially to those who do not attend City Council Meetings. I have been sitting on street corners with a sign asking for “NO on “C”. I am amazed how many people have been asking “what this is about”. That is what prompted me to write this commentary. I am going back to original items that were on agendas concerning additional money to hire more police officers. My reason is also to shed light on how our city manages business. Then the heading of this document will be obvious. I have attended every Antioch City Council Meeting that had the Sales Tax issue on the agenda. In the beginning there were 2 measures being proposed. The one not on the ballot, was designed to collect additional money from business license fees on rental properties. Let’s start at the very beginning to give you knowledge of “how” this Measure was allowed on a ballot in the first place. The City Council declared a Fiscal Emergency using increase in crime to authorize Measure “C”. A consolidated statement to be used on the Ballot was sent to the CCC Elections Department. (CCCED). The CCCED required the City to agree to pay Ballot costs. The Council complied immediately approving the cost of over $22,000.00. That is charged even if the measure fails. A very costly deficit win or loose. First agenda item proposed increasing income from Business Rental Fees. Currently Apartment and Multiple Dwellings are charged rental fees, Single rented Residences are not. The idea was to charge a $20.00 monthly license fee on single rented properties. The money would be used for additional Officers. A number of homes have been bought in bulk, are owned by investors for the sole purpose of making money, a return on investment (ROI). ROI from dwellings is certainly a Business and has made a large impact citywide. Adding single or multiply owned individual property to require payment of Rental License Fees would equalize treatment to all parties in the rental business. Council members Harper and Agopain made many statements telling us that we need more officers to “prevent” and “reduce” crime. Police statistics were used to support their claims. The need for more safety stressed. Both the Mayor and Council Members said that they were not going to “let criminals take over our city”. The solution is more police meaning more “boots on the streets”. They insinuated that criminals would not want to come into Antioch because added police would defer them. I made citizen comments at every meeting suggesting alternatives. I talked of more focus on developing cohesive neighborhoods instead of more police. I gave our Council documents about the city of Richmond’s applied efforts to reduce crime which was independent of police methods; something that Antioch might apply. I stated that more officers would not “prevent or reduce crime”, it might reduce “response time” but Police intervention is after the crime has been committed. There’ll always be criminals; they know consequences if caught in the act but have no fear of police. Suggesting that they will avoid Antioch because of additional officers is a farce. The Council placed an order for an Independent Survey of constituents to help them determine what to do. The cost of the Survey was $18,000.00. Only 400 Citizens were surveyed. The forecast resulted in an “estimate” that if both measures were on a ballot one would fail. A well-known group up of citizens ‘The Breakfast Club”(which consists of former council members, Ex-mayor, and other businessmen) appeared before the Council and advised them that they were in support of applying the Rental Fees but were against any Sales Tax increase. I had also pleaded (twice) saying that the fee option was best because it was fairness in business, would provide a stable yearly amount of money, and it wouldn’t be limited to 10 years. After the survey results were interpreted which indicated that if both items were placed on the ballot “one would fail” (and advice that a 2/3 majority vote would also be very risky). Our City Council deleted the Rental Fee idea and choose to go ahead with only the increased Sales Tax Measure. Then with fear of failure placing it on the ballot with specific use of funds to the Police Department requiring a 2/3 majority vote. They modified the earlier decision changing direction to send the money into the General Fund. Measure “C” reasons changed! Can we still claim the “emergency” Read the ballot the reason for the tax has been changed! The tax is no longer going to the Police Department it will (supposedly) be divided into a fair distribution for ALL city service improvements. Manipulation? To influence a yes vote by citizens the Council has promised to set-up (yet another) Commission as oversight of tax expenditures. The group of 7 will report once a year, will be appointed by the Mayor, and will have no power. If you read the “Yes on “C” signs , and receive a big post card, and stickers on your newspaper you should take the time to find out where all of the money to pay for this massive advertising is coming from . Data is available at the City Clerk’s office. My investigation indicates that people owning multiple single unit rental properties have contributed over $30,000.00. Their Ads are propaganda. All placards tell you the money is for more police! This deception is supported by the Mayor and Council Members. I have reported $150.00 contribution for NO NEW TAXES signs without deception. In closing I offer this for your consideration: The addition of Police Officers to “Prevent Crime” is pure speculation. The change directing income into the General Fund is a manipulation. If Measure “C” passes the City Council will likely continue “deficit spending”, they have in the past and there is no reason to believe this will change. It is likely that hiring more police will start before money for tax has been collected and placed into the General Fund. The old “Buy now Pay later” repeatedly used by our “leaders” is one of the reasons that our city is near bankruptcy today. Considering money contributed to influence the “WIN” compared to the amount spent supporting LOOSE makes me feel like it is a David vs. Goliath battle. I assure you that I am not against any improvement of our Police Department. I supported the Rental Business Fee, I own and rent one property and had no problem with that proposal. There is more to consider, just months ago Police Department benefits were increased. Retirement benefits cost went up. (Another “spend forward action”). The Police Chief pleaded for the extra money to lure (some costly) “experienced” officers. Some he had interviewed wanted more than our city was currently offering. Placing “C” on the Ballot because we need more income to eliminate an “EMERGENCY” is wool over the County Elections Departments eyes. We have been in an “emergency” state for the last 5 (or more) years! Why the “emergency” now? Why wasn’t it declared before the huge reductions of all city services? That is a mystery to me. I think our citizens should have been asked to send written ideas on possible solutions to reduce debt and used to develop and implement a strategy to solve our problems. That, however would require more than a 3 minute input at meetings and it might be considered as interference. November 5th is my 79th Birthday. I have been a resident since I was 9 ½ years of age. I hope David mentioned earlier will prevail. I thank you for reading this to the end. I have tried to minimize insinuation, within this article, it is opinion, and everything written is based on my participation and observations of City Council actions for many months. I will appreciate your Gift at the Ballot Box when you Vote “NO on “C”. Again, I thank all of you for reading this to the end. It is now close to the end of the 2013-14 football season and Deer Valley High School is shining bright with a 7-0 record, while injuries have plagued Antioch High School to 1-6 entering for the season. In their cross-town game, last Friday night, the Deer Valley Wolverines outscored the Antioch Panthers 49-7. Wolverine Head Coach Rich Woods is on pace to lead his team to its third undefeated season in an eight-year span. He has been the most prosperous football coach at Deer Valley with a 67-28 regular season record since his inaugural year in 2004. Along with his impressive winning percentage, Woods has also coached the first two players from Deer Valley to reach the NFL. One of the key components this season for Deer Valley has been quarterback Nsimba Webster. Not only is Webster leading the team through the air with nine passing touchdowns without an interception, but is the Wolverines’ top rusher with 107 yards per game and 12 touchdowns coming on the ground. Webster has been contacted by multiple Division-I colleges, but has not completely committed to football quite yet. He also has proven his talents on the hardwood, and had a starting role on the record-breaking basketball team last school year. When it is all said and done, Webster wants to leave behind a legacy that marks him as Deer Valley’s top competitor. “I just wanna be the best athlete ever at Deer Valley… And make a name for myself,“ Webster said. The Antioch Panther’s football program was once a dominate force in the Bay Area, but has been in a drought since the 1990’s. Head Coach John Lucido is on a mission to revive the team, and has already made two postseason appearances in his three-year tenure. This year the squad has been halted by wounded players and a small cast of seniors. The roster consists of only 12 seniors with 31 underclassmen that include five sophomores and one freshman. That one freshman is running back and linebacker Najee Harris, who transferred from a high school in Seattle, WA approximately a month ago. After playing for frosh and junior varsity, Harris will be making his varsity debut in Friday night’s match up at Liberty High School. The Bay Valley Athletic League is as tough as it has ever been this year with a variety of teams posing major threats. Pittsburg High is ranked among the top 100 teams in the state, with running back Harris Ross tearing up the field for 254.2 rushing yards per game and 17 touchdowns. Meanwhile Freedom High possesses one of the nation’s most touted recruits, running back Joe Mixon, who has attained nearly 50 Division-I scholarship offers. “There have always been top athletes in our league,” Lucido said. But, Deer Valley dominated Freedom 35-7. Antioch plays at the winless Heritage High, tonight, while 4-3 Liberty will visit Deer Valley. Antioch resident Karl Dietzel holds a No on Measure C campaign sign at the entrance of In-Shape on Lone Tree Way, on Friday morning, October 11. 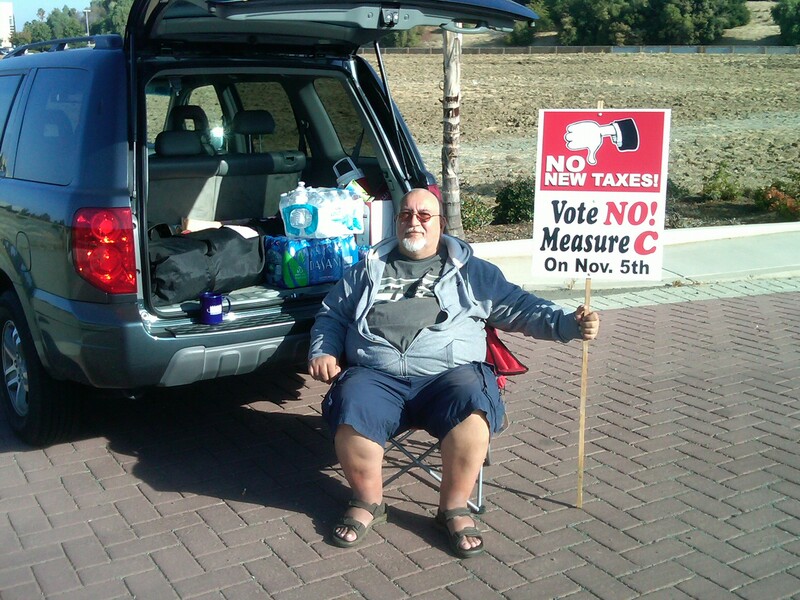 Antioch residents Karl Dietzel and Fred Hoskins have mounted a grassroots campaign to oppose Measure C, the half-cent sale tax increase measure on Antioch’s November ballot. Dietzel recently held a sign made by Hoskins at the entrance to the In-Shape City health club on Lone Tree way, one morning. Their effort is juxtaposed to the well-financed yes on Measure C campaign, led by Antioch Mayor Wade Harper, that’s raised over $44,000 as of October 19th and has signs throughout the city, as well as newspaper ads and mailers. The election is Tuesday, November 5. On Thursday, October 24, 2013 at approximately 11:50 AM, the Contra Costa Fire Department responded to a residence in the 2300 block of Whitetail Drive on a report of a house fire. They arrived to find an electrical box to the home on fire which they were able to quickly extinguish. No one was home at residence; however, evidence of marijuana cultivation was found inside. The Antioch Police Department was summoned to investigate and confirmed a large scale marijuana cultivation operation. Investigators were called in and ultimately seized approximately 1100 marijuana plants from the home along with marijuana cultivation equipment. The case is still being investigated by the Antioch Police Department’s Special Operations Unit. Anyone with information regarding this case is encouraged to call Detective Koch with the Antioch Police Department at (925)779-6895. You may also text a tip to 274637 (CRIMES) using key word ANTIOCH. On Thursday, October 24, 2013, Antioch Police Department undercover officers located Alan Wilson who was a parolee at large in the area of Sycamore Drive and L Street. Undercover detectives along with patrol officers attempted to make a traffic stop on Wilson, but he fled from them, leading officers on an 8 minute long pursuit through Antioch. 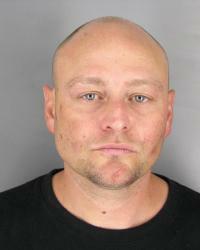 The pursuit ended in 2900 block of Filbert Street in Antioch, where Wilson ditched his vehicle and fled on foot. Wilson fled over neighborhood fences but was apprehended a short distance away. Wilson was found to be in possession of a large amount of narcotics, cash, and evidence of narcotics sales along with a loaded handgun. Wilson was sent to the Martinez Detention Facility on his Parole Warrant as well as charges of narcotics trafficking and gun possession. Anyone with information regarding this case is encouraged to call Detective Mortimer with the Antioch Police Department at (925)779-6941. You may also text a tip to 274637 (CRIMES) using key word ANTIOCH. The financial reports of the yes on Measure C campaign, officially known as Citizens for a Safe Antioch in Support of Measure C, campaigning to get voters to approve a half-cent sales tax increase in Antioch, disclose that the $44,170 that’s been raised to date has predominantly come from outside of the community. The latest reports are dated October 19. The largest contributions include $10,000 from the Building Industry Association of Northern California, $5,000 from Allied Waste, $5,000 from the California Association of Realtors PAC, and the most, $13,650 came from the California Apartment Association, which opposed the landlord fee the council majority chose to not put on the ballot. As for where the committee spent their money, they bought signs from a company in Oakdale, paid for someone in Chico to design the signs, printers in San Francisco and the consultant (the same one who ran Harper’s, Rocha’s and Tiscareno’s campaigns, last year), who is based in Concord. So much for shopping local. Wade Harper signed the forms as the Principal Officer and Martha Parsons as the Committee Treasurer. The campaign finance reports are public documents available for anyone to read and obtain a copy of at the Antioch City Clerk’s office on the first floor of City Hall, 3rd and H Streets. No formal opposition has developed, although two men have made and displayed No on Measure C signs, including Fred Hoskins and Karl Dietzel. A newspaper arrived at my home this week with a Yes on Measure C sticker on the front page as did two mailers urging me to vote Yes on the half cent sales tax increase on the November 5th ballot. One mailer was sent by the Antioch Police Officers Association (APOA) and one by Citizens for a Safe Antioch who also paid for the newspaper sticker. The ambiguity of how the revenues will be spent should prompt you to vote NO on Measure C. The reason the city didn’t put a dedicated police tax measure on the ballot is because it would require 2/3 voter approval to pass rather than a 50% approval plus one vote needed to pass Measure C, a general tax measure, similar one of which was shot down by voters in 2010. Drug Activity: The CA Drug Abatement Act allows cities, through their city attorney to remove occupants from any building or place where illegal drug activity takes place. Violations are punishable by fines up to $10,00 and 6 months in jail. Additionally, a fine up to $25,000 may be imposed against each defendant, half of which is payable to the prosecuting city., which is also entitled to recover all its attorneys’ fees and investigation costs, including from the property itself with a lien. Prostitution and Sexual Crimes: The Red Light Abatement Act allows any city, though its city attorney to vacate and board up for one year any building or place used for these crimes. The same penalties and cost recovery rules apply as with the Drug Abatement Act. Cities may use either act without passing an ordinance. Gang Activity: The city can file a lawsuit against gang members though its city attorney under the California Street Terrorism Enforcement and Prevention Act. Every building or place in which gang members commit certain offenses e.g. robbery, murder, unlawful drug sales, rep, intimidation, theft or burglary, any offense involving dangerous or deadly weapons can be declared a public nuisance. A fine may be imposed against individual gang members and the property owner. Attorney fees are recoverable if the city has a properly worded ordinance. Gang injunction programs developed in cooperation with the local district attorney can be a very effective tool in combating gang crime. Numerous other ordinances allowing the city to impose administrative fines for various violations of the municipal code can be enacted. If the aforementioned violations and other municipal code violations were vigorously enforced and the applicable fines and cost recovery rules followed, the city would be a safer place to live and its coffers benefit from an increase in revenue. PUBLISHER’S NOTE: Opinions expressed by columnists and/or letter writers do not necessarily reflect the opinions of the Antioch Herald, it’s owner, editorial staff or management.